Outdoor Chess for gardens, parks, resorts, hotels, schools, campgrounds, back yard, chess club, home furniture decoration and community centres. Variety size for outdoor playing : from 16" to 72" king tall. Also 8" and 12" wooden chess for indoor or for table games. The Black Chess Table for you. Made of high quality teak, this black chess table is equipped by small wheels and two storages in each side to keep your chess pieces, and designed in stylish way. The board is polished in black and dark brown colors. Have you found more reasons to bring the black chess table to your home? 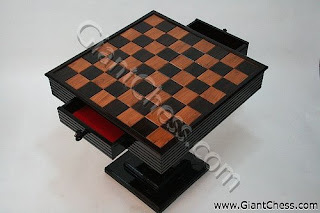 GiantChess.com is one of the world’s foremost manufacturers and providers of large-to-giant-sized chess pieces, with coordinated chess tables, chessboards, and other chess accessories. GiantChess.com is located on East Java and recognized for the quality and beauty of our chess products. The chess is carved in original and precious Indonesian teak. Outdoor Furniture Published by : Giant Chess Manufacturer.